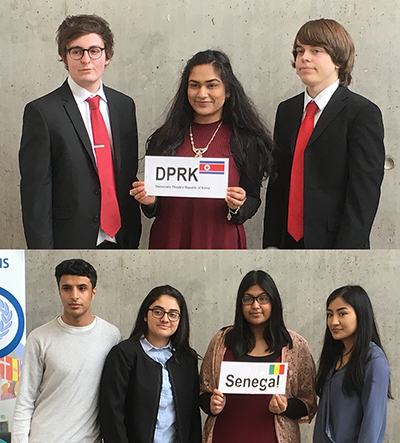 Budding diplomats from The Sixth Form College, Solihull put their debating skills to the test recently as they took part in the Model United Nations Conference. The College took two teams of students to the Conference at Joseph Chamberlain College; one delegation represented Senegal and another represented North Korea. These countries were chosen by the students themselves in order to represent a range of views and cultural standpoints. In the run up to the conference, the students researched these countries and a range of issues that pertain to the various committees of the United Nations. During the Conference itself, students prepared resolutions relating to a variety of issues ranging from drug trafficking in South-East Asia, the question of Tibet to the problem of the Death Penalty. Students presented their resolution and debated the issues before the resolutions faced a vote. Successful resolutions then went to the General Assembly later in the Conference, when all delegates from all schools and colleges were present. Two students won the prize for ‘Best Resolution’; Zaynah Iqbal (aged 16, from Birmingham) for her push to tackle violence in Latin America, and Halema Yasmin (aged 18 from Birmingham) for her joint Security Council resolution regarding the Spratly Islands. Fellow student, Joe McMullen (aged 16, from Solihull) won the award for ‘Persuasive Speaking’ for robustly and persistently presenting a North Korean response to ‘American Imperialism’.